Location, location, location! When I start a mural I try to consider every holistic element connected to the space: what is the light in the room like? What is the predominant color scheme of the surrounding furniture? Will the room be used for entertaining, meal times, relaxing, working, or a combination of all three. Architectural elements are a big factor. If a wall includes an element like an archway or other feature that could break up the mural, it’s generally better to include them in the composition. 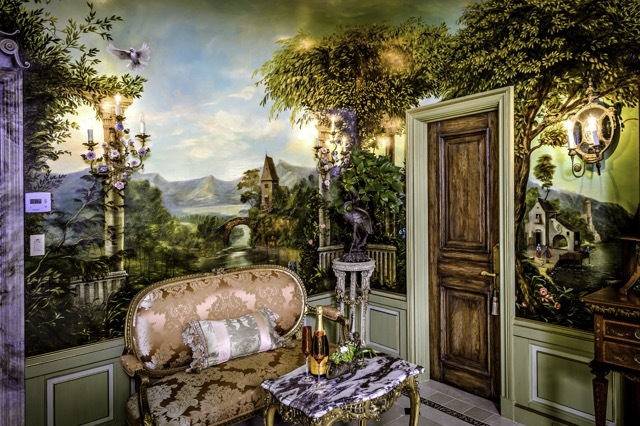 Murals have a tendency to transform the space they are in. It’s important to match the complexity of the design of the mural to the complexity of the design. A design that’s too simple can look dwarfed and insubstantial on a wall that’s too big for it. A wall that has too many elements painted on it will look cramped and busy. Ask your artist about their thoughts on the available space and if that space is appropriate for the design. When you look at samples of their prior work ask about the size of the wall and about the technical challenges they faced in realizing the mural in the allotted space. You want to be sure that your artist is working in their comfort zone, not just in terms of the medium, but in terms of the specific compositional challenges that come with each new project. 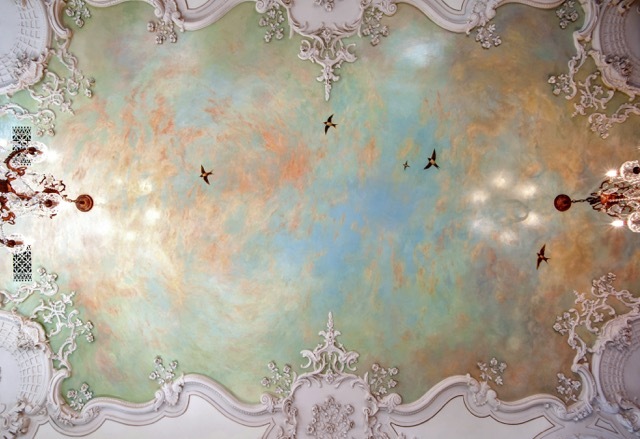 This massive mural turned a beautiful ceiling into a breathtaking one of a kind experience. When a director sets a movie in the past, the crew will spend hours researching period details to ensure that all the costumes, props, and locations are appropriate, realistic, and compelling. I like to approach murals with the same respect and attention to detail. If you need to convey a specific historical period and need everything period accurate, down to the specific handles on the specific table settings, that will take a lot of time. If a mural relies on a uniformed or armored soldier, it’s easier to faithfully represent it if I see it on a model. This will add to the cost, but leads to a much more striking and satisfying end result. Communicate your needs to your artist, which will allow them to factor research time into their overall costs. I strictly work in oils only, your walls are my canvas, with oils you can achieve a color and depth that surpasses other mediums for me. I put a premium on detail work, so the finest sable brushes are a must. 5. What are you trying to say? Just as a mural inhabits a specific location in your house, it comes from a specific place in your heart. When people come to me to plan their murals, I try to identify specific themes and key emotions. Perhaps you’d like to recapture a historical period that you never got to live in. It’s best to be incredibly specific with why you want it, as it helps your artist work with you to find the exact image and concept to illustrate that sentiment. Have questions? Feel free to drop me an E-mail and I will help you get started!